Zoya Suvi and Lynnderella Beleaf Is Magic were both purchased by me. All opinions are my own honest thoughts. I am on a mission to get some of my untrieds posted here. I am not the worst person I know in terms of untrieds, I believe my untrieds drawer has maybe 30 polishes in it right now. However, I tend to let the same polishes sit untried for months, poor things! I was good this past weekend though, and wore two untried Lynnderellas. My favorite of the two was Lynnderella Beleaf Is Magic. 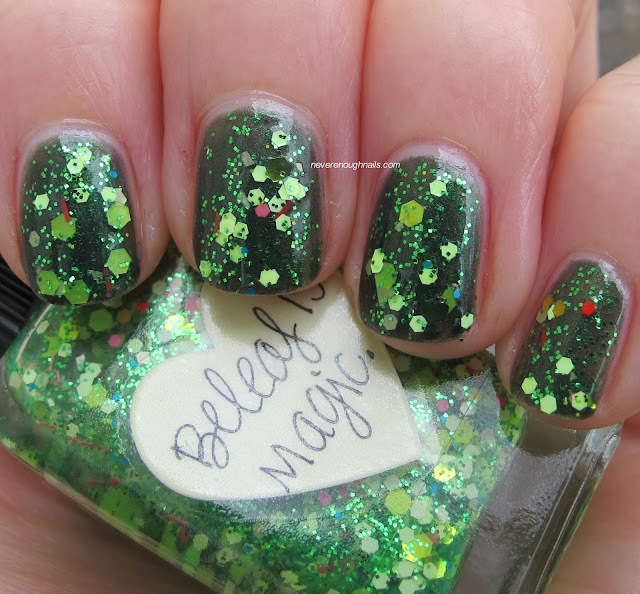 Beleaf Is Magic is a pretty mix of neon yellow and green hex glitters in assorted sizes, small green microglitter, and some random red, pink and even some blue glitter pieces, all in a clear base. In person, the neon yellow glitter made this mani look like it was glowing! I loved it! I used two coats of Beleaf Is Magic over two coats of Zoya Suvi for this mani. Beleaf was very easy to apply, lots of glitter came out and I didn't have to work hard to dab it on my nails. Piece of cake! I think Beleaf would look amazing over almost any green polish, black, white, and definitely pale yellow. Color: two coats OPI Congeniality Is My Middle Name, two coats Lynnderella S.W.A.K. Lynnderella S.W.A.K. was purchased by me, OPI Congeniality Is My Middle Name was sent for review. All opinions are my own honest thoughts. 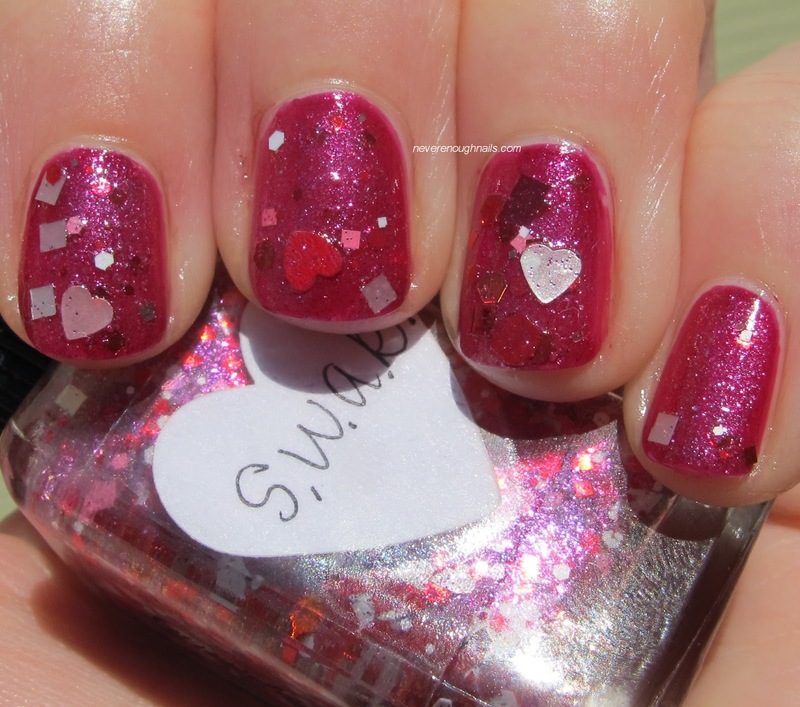 This little seasonally inappropriate treat is Lynnderella S.W.A.K., from the Groundhog Day collection. 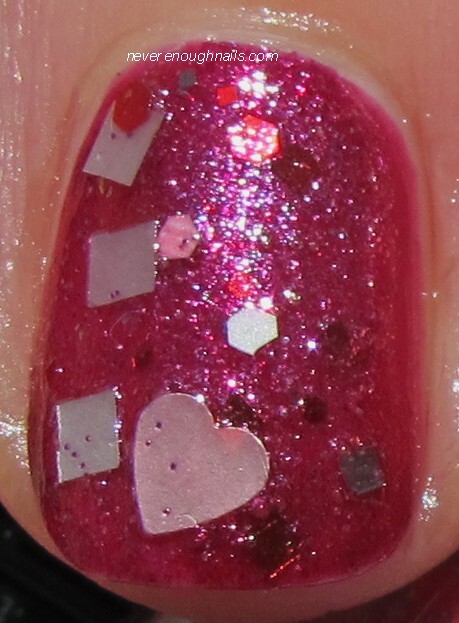 I did not intend for this mani to be so Valentine's Day-y. I selected OPI Congeniality Is My Middle Name as my base because I had it in my purple drawer and thought it was more of a dark red-purple, rather than a shimmery pinky red. I thought that putting S.W.A.K. over a purple would make it less Valentine's Day themed, but obviously I picked the wrong base for that! I think I will love S.W.A.K. in February LOL! Here is Lynn's description of this complex polish: "S.W.A.K. 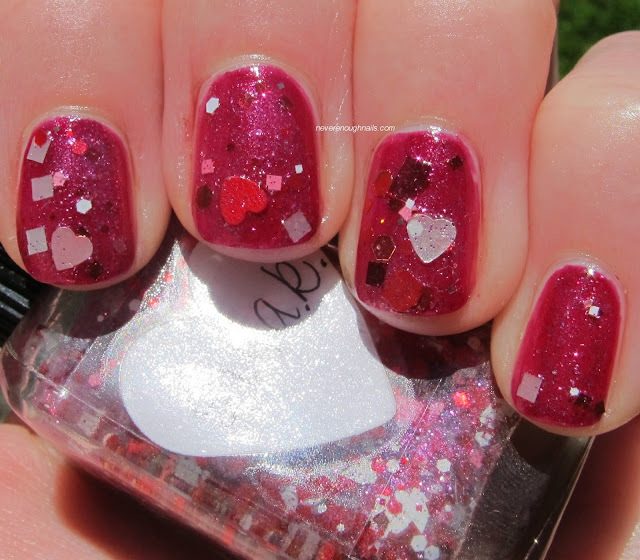 (sealed with a kiss) is another liquid valentine multiglitter: assorted red, white, pink with a hint of gold in a base spiked with hot pink shimmer. Also contains scattered pink, white, red and gold hearts." S.W.A.K. was pretty easy to apply, I think it was harder to get all of the larger pieces on the nail than it was with Beleaf Is Magic. Not hard, just not as easy as Beleaf. This is basically one dabbed coat of S.W.A.K., with a little bit of a second coat, mostly to get that white heart on my ring finger and some more white pieces on the other nails. I really like both of these Lynnderellas, I think I'll love S.W.A.K. a bit more in the proper season. I would wear Beleaf any day though! Lynnderella polishes are available on lynnderella.com and Norway Nails. Zoya Suvi, Lynnderella Beleaf Is Magic and Lynnderella S.W.A.K. were purchased by me, OPI Congeniality Is My Middle Name was sent for review. All opinions are my own honest thoughts. I liked them a lot too TikiBarbie!